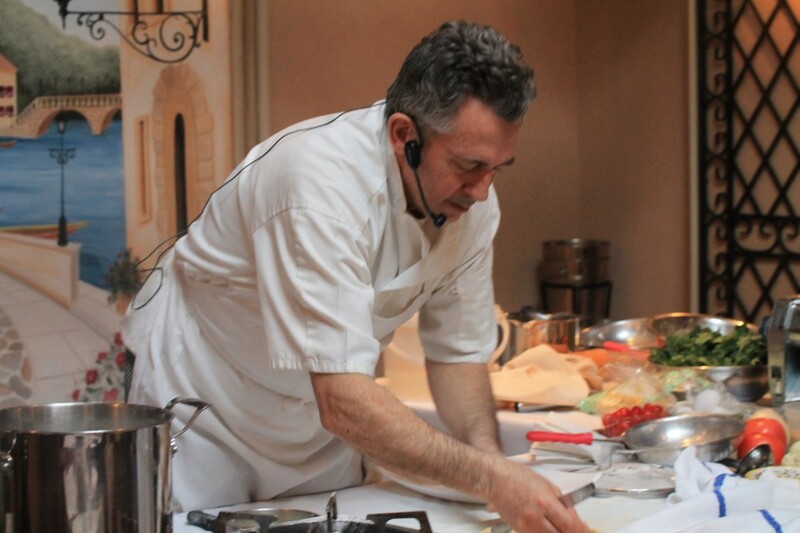 Last month on Spiced Peach Blog, I wrote about the Late Winter Cooking Classes offered by Chef Nunzio Patruno, a Chef I had written articles on years ago at the time he served as Chef/Partner of the former exclusive Monte Carlo Living Room in Philadelphia. Last Saturday, the class I chose to attend, Nonna’s Pasta and Vegetables instructed about thirty eager enthusiasts on making a variety of homemade pastas using the same dough base with slight variations, and then easily combining them in very simple and rustic ways utilizing from a variety of different vegetables. 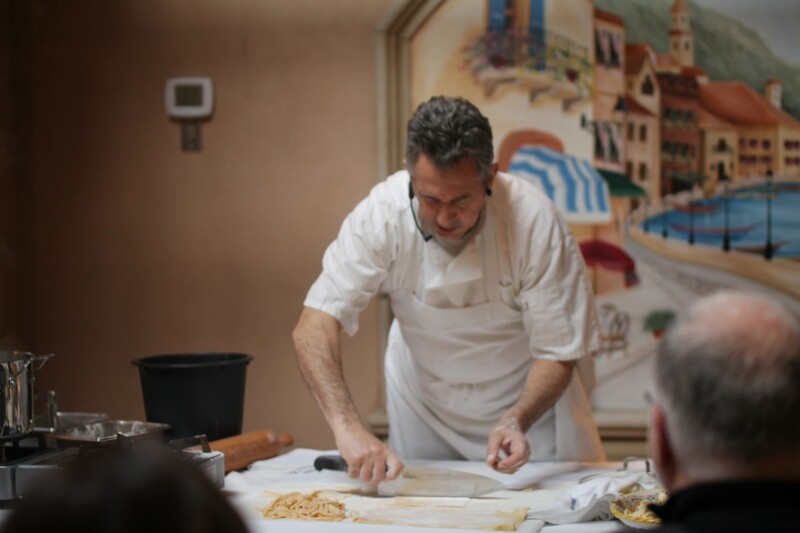 The class, reflected the region of Puglia, Italy, the home of Chef Nunzio’s childhood where his mother, and really, according to Nunzio, where all of the mother’s in the region rapidly prepare from a broad repertoire of homemade pastas each Sunday to offer at the family table. Prepared homemade Pastas from Pasta Dough included Lasagna Sheets, for the Lasagna with Eggplant, Tomato, and Basil shown above, Orecchiette Broccoli Rabe with Fried Mullica (an anchovy, breadcrumb topping), and, Tagliatelle with Cauliflower, Cannellini Beans, Cherry Tomatoes, Garlic and Olive Oil. Each of the dishes provided can easily be prepared in your home, even if you choose to use dry or frozen pasta and you can find each of the recipes below. 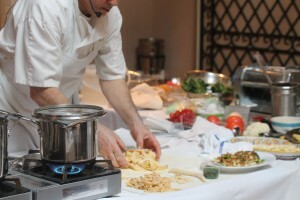 The Cooking Class format was Demonstration Style as Nunzio, rigged with microphone and his entertaining style of humor, instructed each of the techniques while preparing. Afterward guests were treated at the pre-set tables to samples from each of the dishes, complete with glasses of Nunzio’s homemade wine and small, crispy, cream filled cannoli’s for dessert. Really, it was a lovely way to spend an afternoon and add a few inspirational recipes to the repertoire. 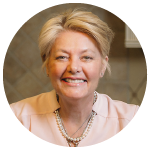 What I find most helpful about attending a Cooking Class, and perhaps you will agree, is picking up some easy, new tips as compared to just reading a recipe and attempting duplication. In my case, the new re-learned reminder of years past is creating a batter for dipping, as in this case, for eggplant, all into one bowl, instead of separately dipping the eggs and flour. For many people, the ease of presentation demystifies aspects of learning new cooking techniques enabling confidence to recreate and practice in one’s own home, an ‘I can do that’ feeling. 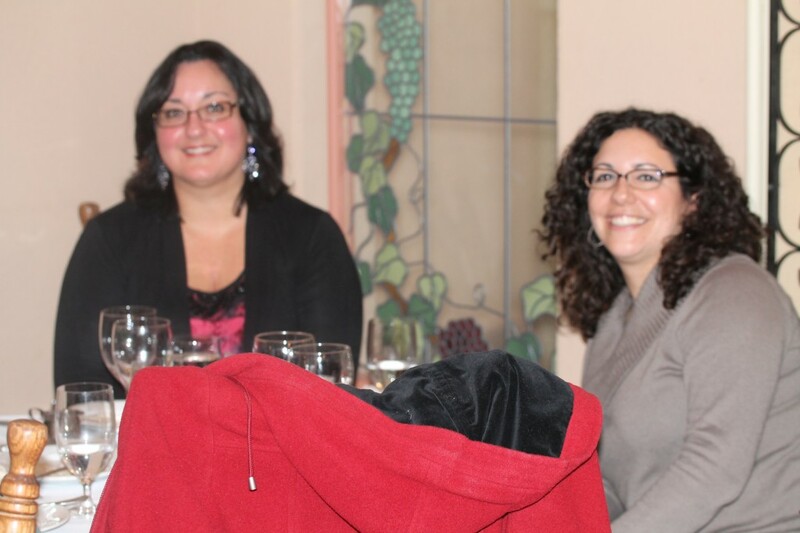 Besides Cooking Classes such as this can be lots of fun. 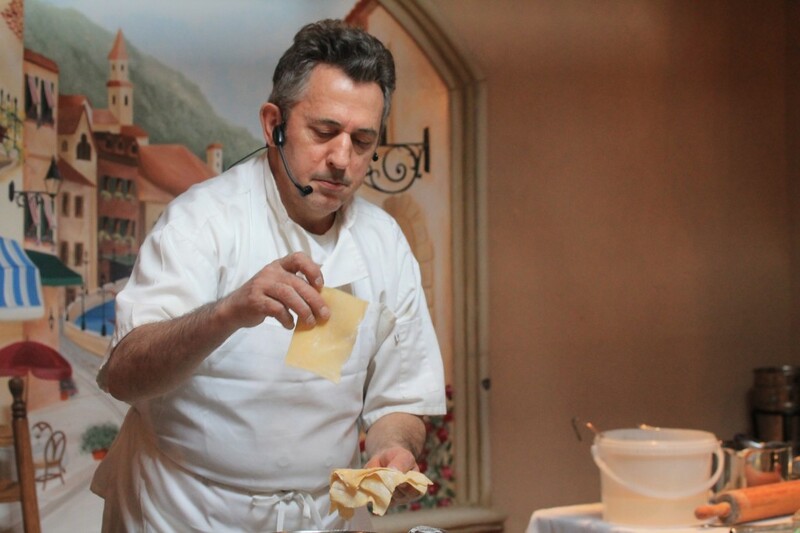 For those of you who are familiar with Nunzio in his Monte Carlo Living Room Days, you will probably remember besides his renown as a Chef, he was also known for his congeniality, regularly coming out of the kitchen and welcoming diners from the city’s wealthiest regulars to the young couple enjoying a special anniversary dinner. 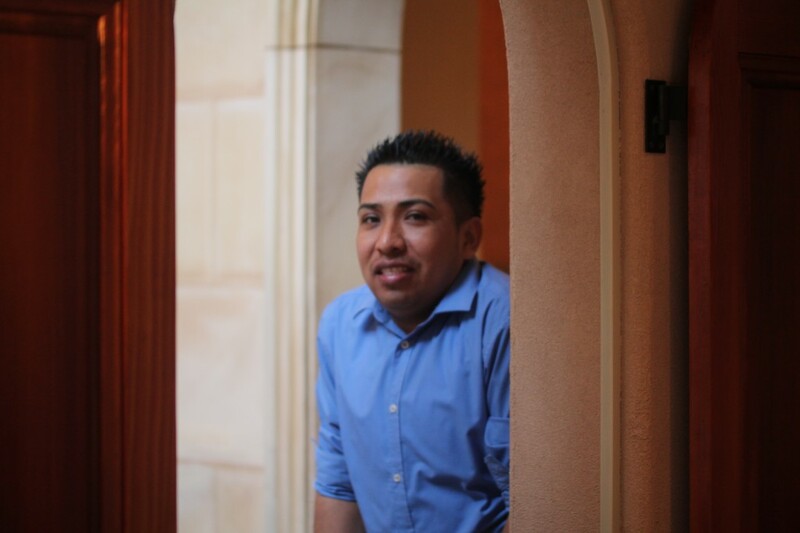 This writer also remembers his easy accessibility in article interviews or just checking in to verify cooking information. 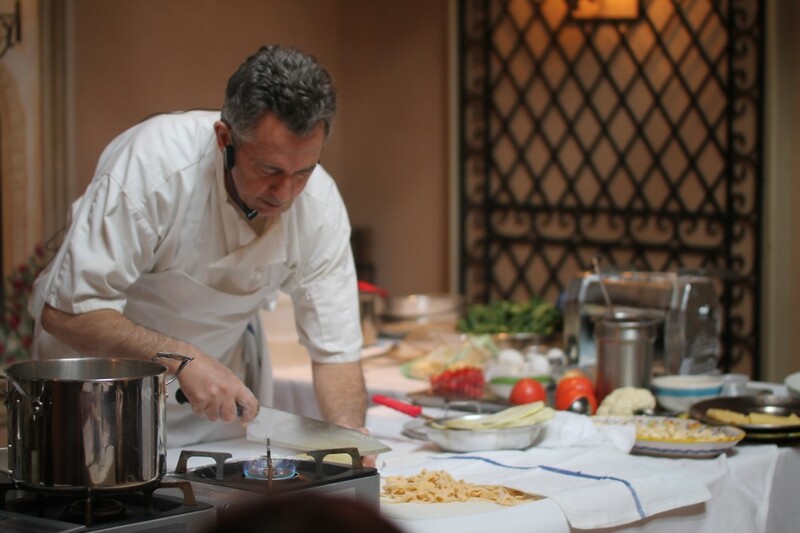 The reason I mention this is because it also realtes to the Cooking Class last Saturday which hosted an astounding number of attendees who after all these years continue to follow Nunzio from the Monte Carlo Living Room, as well as the attached Primavera restaurant that provided fresh and simple Italian specialties. 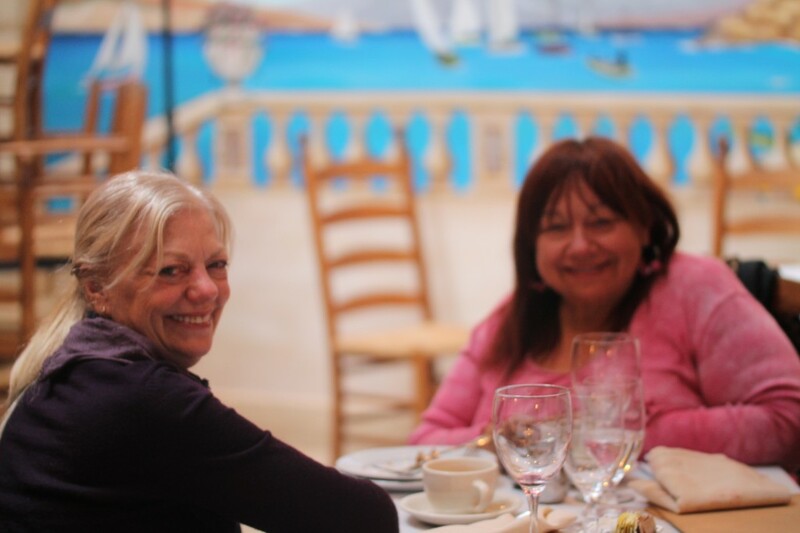 One of the women at my table who attended with her longtime friend and former colleague are both former regulars of Primavera restaurant and she does not even cook. 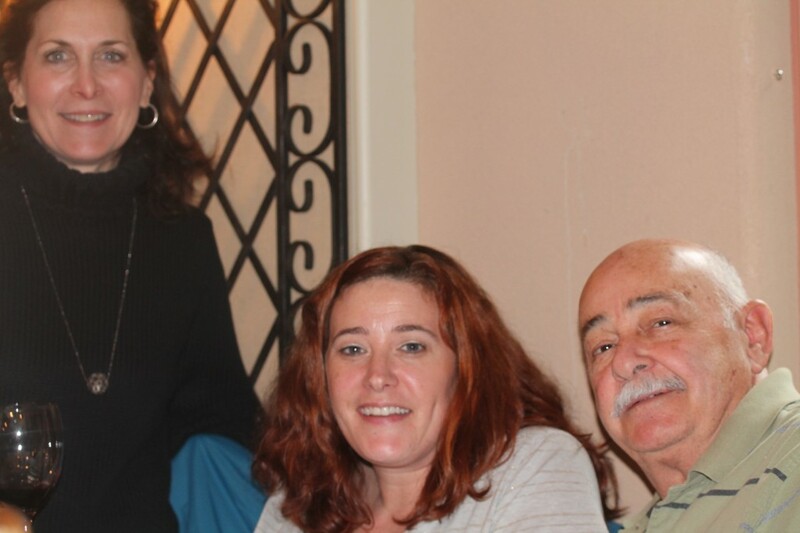 Imagine my surprise on that one, but she loves food, she loves to learn, and over the years, she has continued a friendship with Nunzio, and he still prepares the family birthday cakes for each of them as the occasions continue. As I made my way around the room there were a striking number of men in attendance, two of whom I remember from Nunzio’s last month Wild Game Night Feature, along with families, women who had received the Cooking Class series as Valentine’s presents from spouses, and local friends and regulars all of whom are now part of the Nunzio Famiglia. Below are a few shots among the happy guests. 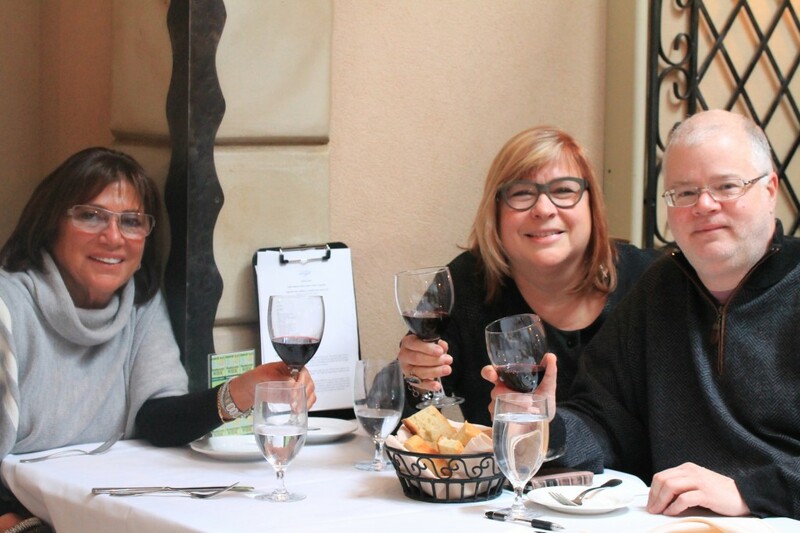 Friendly warmth and building familial relationships over the years and throughout the community within his restaurant business has paid off for Nunzio, and for his wife, Mirabel who also possesses a great spirit and sense of humor. 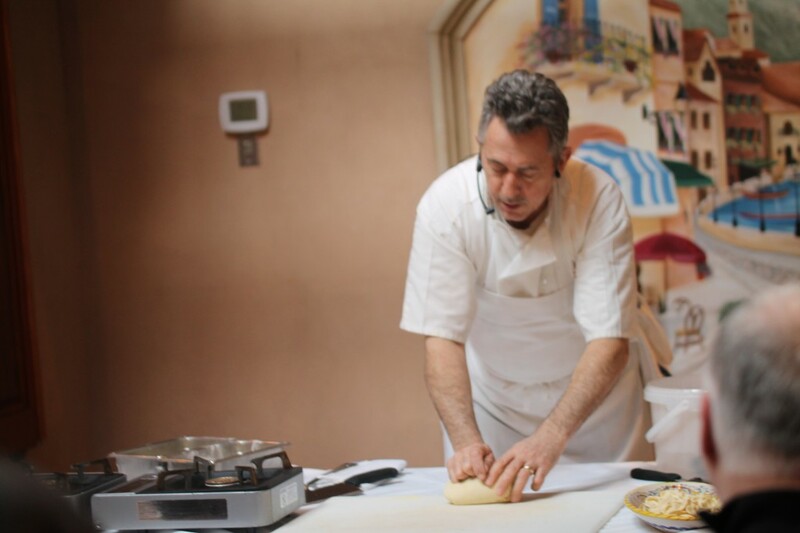 The sustaining, straightforward and uncomplicated food at Nunzio’s Ristorante Rustico reflecting his childhood roots in Puglia, Italy is just the extra given. 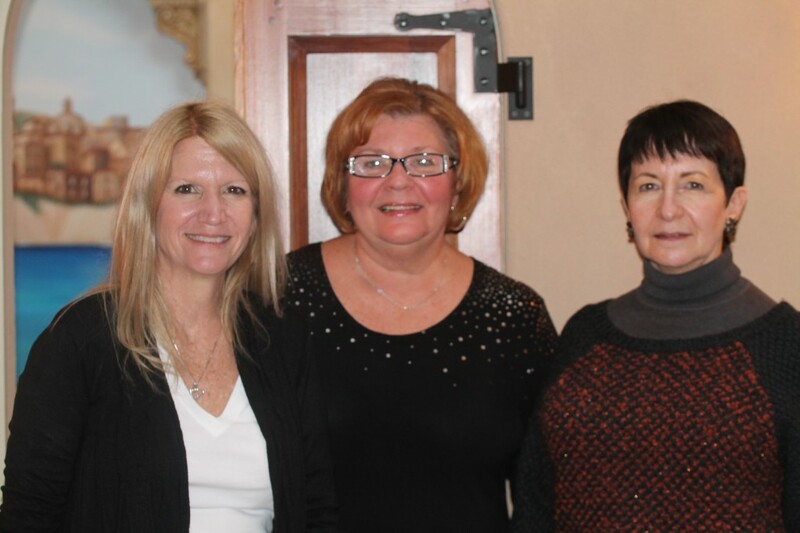 One lovely Saturday afternoon shared by all, Nunzio’s Ristorante Rustico, Chef Nunzio Patruno, Three Nonna’s Pasta, Vegetables Cooking Class. In a mixing bowl add the eggs, milk, flour and one pinch of salt. Whisk the ingredients together creating a batter. Dip the sliced eggplants into the batter and pan fry each slice. Set cooked eggplant aside. In a large pot of boiling, salted water, cook fresh pasta sheets for one minute. Remove the sheets as they float to the surface with a skimmer. Drop lasagna pasta sheets into a bowl of ice water to refresh. 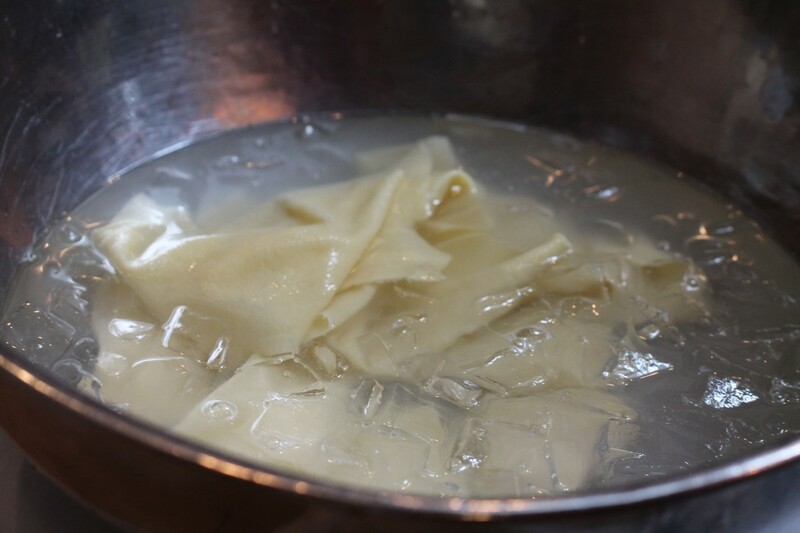 Remove lasagna noodles from ice bath and dry with a kitchen towel and set aside. If you are using dry pasta follow package instructions then proceed. Pre-heat oven to 375 degrees. 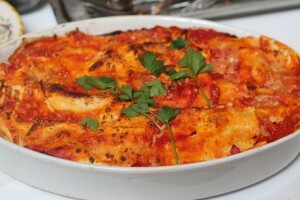 To assemble the lasagna, coat a baking pan or a Pyrex glass dish of about twelve inches with extra virgin olive oil. Begin by coating the bottom of the pan or dish with a small ladle of tomato sauce. Then, a layer of lasagna sheets, adding on top then another small ladle of tomato sauce and a layer of the pan fried eggplant slices. Sprinkle with the cubed mozzarella, the pecorino (or Parmesan if using) and some of the basil. Keep repeating this process until you reach the top of the dish topping the final layer with the lasagna sheets, tomato sauce, and pecorino cheese. Bake in the oven at 375 degrees for twenty five minutes. 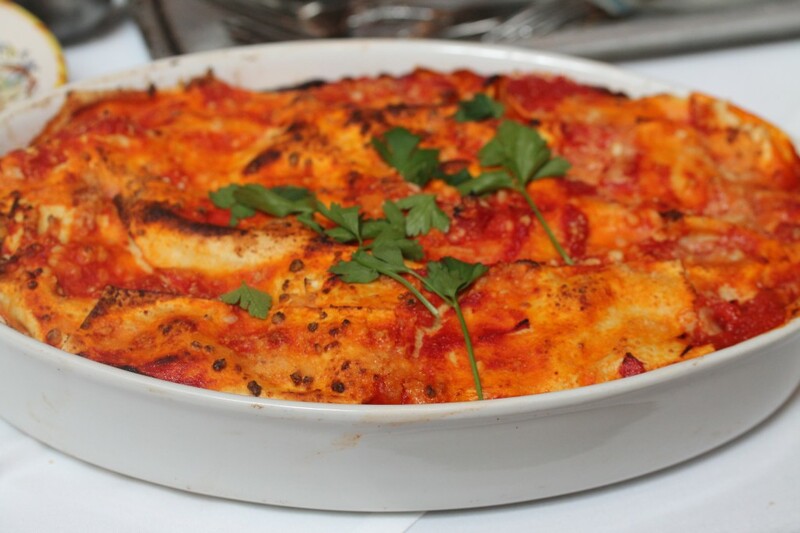 Remove from oven and let the lasagna cool down for twenty minutes before serving. In a large saute pan cook the garlic until golden, add the anchovies, red pepper flakes, and breadcrumbs. Cook down for about three to four minutes on low to medium heat pressing down on crumb mixture using a wooden spoon. Add the Pecorino cheese and parsley, stirring all together until well combined then set mixture aside. 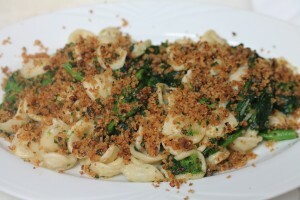 In a large pot of boiling, salted water, add the fresh Orecchiette and cook for three minutes then add the Broccoli Rabe. Cook for two more minutes. Strain the Pasta and Broccoli Rabe and saute in garlic oil, add salt and pepper to taste, then transfer to serving dish. If you are using frozen Orecchiette, follow package directions, then either cook the pasta and Broccoli Rabe separately or add to the forzen pasta the last two minutes of cooking. 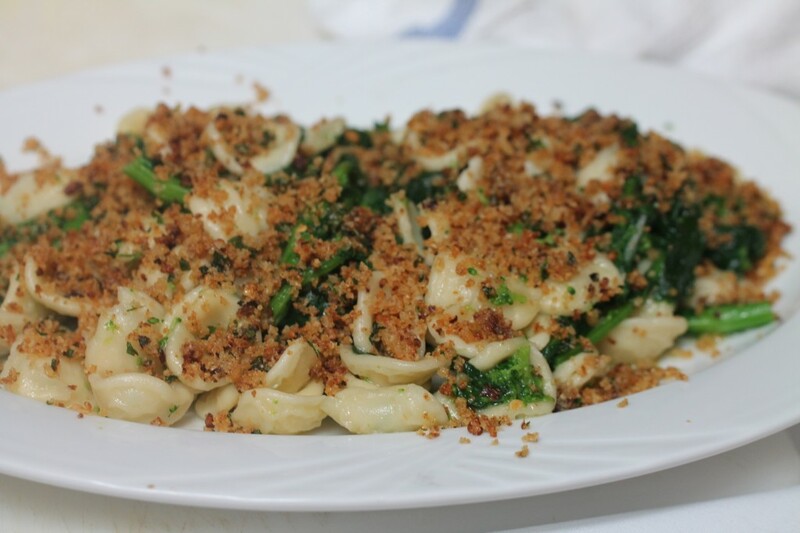 Top Orecchiette and Broccoli Rabe abundantly with the crispy breadcrumb mixture and serve. In a large saute pan, cook the garlic until golden in extra virgin olive oil. Add the cherry tomatoes, red pepper flakes and cook down a few minutes, then carefully add in the cooked cannellini beans, continuing to cook on medium to low heat for a couple more minutes. Set aside the cherry tomato sauce. In a large pot of boiling, salted water add the cauliflower florets and cook for about three minutes. As the water continues boiling add the fresh pasta and continue to cook for about one to one and a half minutes. 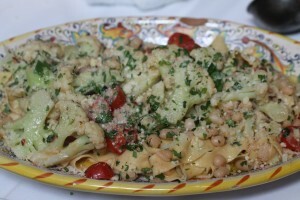 NOTE: If you are using dried Pasta for this dish you will need to cook the Pasta and Cauliflower separately, or, add the cauliflower to the pasta in the last three minutes of cooking. 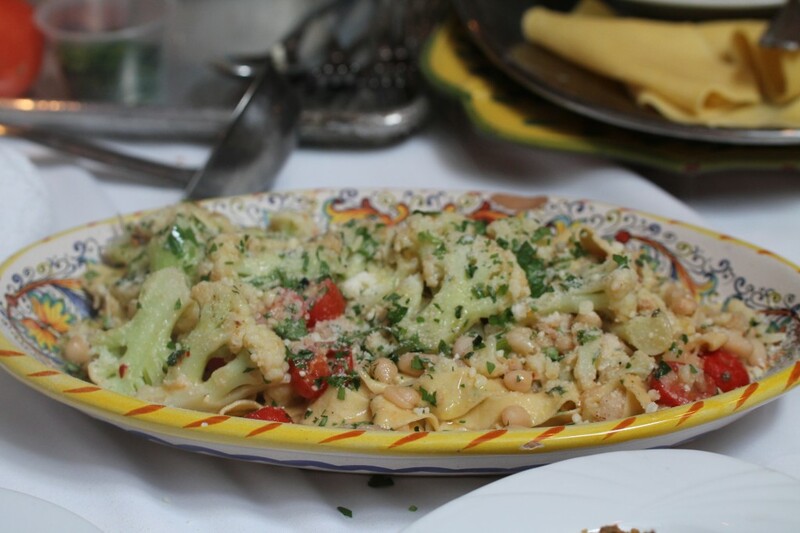 Strain the Pasta and Cauliflower and toss with the cherry tomatoes sauce with cannellini beans, adding a little pasta water to the sauce, if desired before tossing all together. Season with salt and pepper, and stir in parsley. Transfer to a serving platter and sprinkle with fresh Pecorino Cheese. Before serving, drizzle the top of the dish with extra virgin olive oil and serve. In a large mixing bowl, add the semolina and regular flour, salt and olive oil. Then, add six eggs two at a time gently mixing the dough together and adding a little water as needed. Create a firm ball of dough and roll out as thin as possible with a rolling pin or using a pasta machine. Cut into half inch ribbons and sprinkle with flour for the Tagliatelle, making long sheets and cut them into small pieces for the lasagne, or, for the orcchiette, well this process is another article, or perhaps you will go to Nunzio's or a cooking class on your own to get down this easily learned technique. 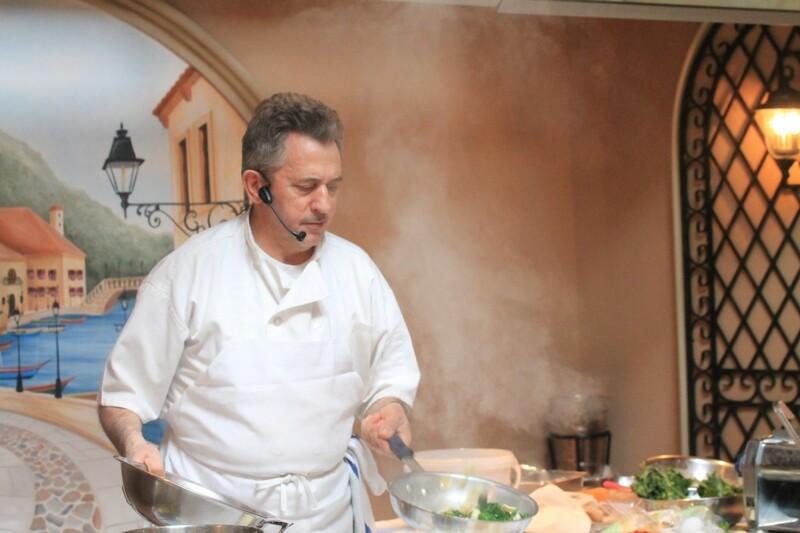 This entry was posted in Artisans- Farms -Markets-Chefs- Journeys, Pasta- Rice-Grains and tagged Chef Nunzio Cooking Classes Nona's Pasta and Vegetables, Chef Nunzio Patruno, Chef Nunzio Patruno and Cooking Classes, Nunzio's Ristorante Rustico, Nunzio's Ristorante Rustico Collingswood New Jersey. Bookmark the permalink. Post a comment or leave a trackback: Trackback URL. 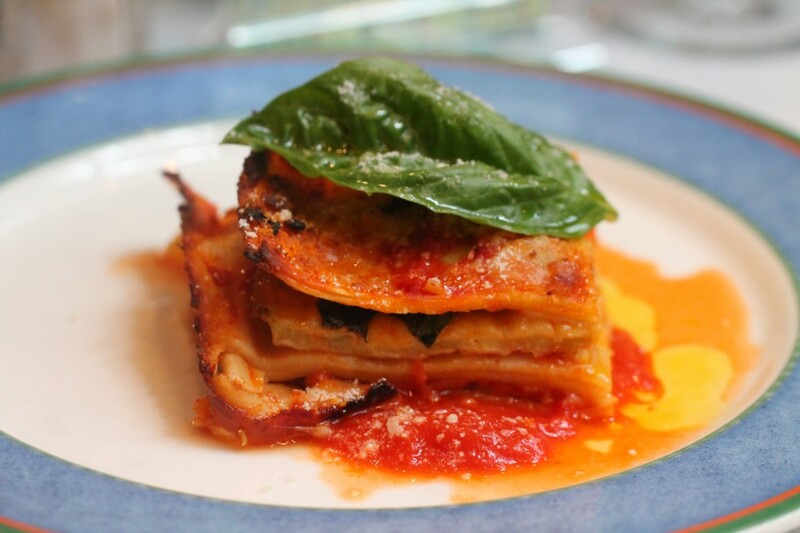 Just made the aubergine, tomato and basil lasagne. Thoroughly enjoyed by everyone. I particularly liked the fresh flavour of the basil-I really must use fresh herbs more!